My current visit to Indianapolis,IN marks my fourth visit to this fine city. We drove through Indianapolis on one of our Kansas trips many years ago. At that time I saw the camp ground and the Indianapolis Children’s Museum. My girls loved the Children’s Museum. Twelve years ago I visited Indianapolis with Bruce and my girls for General Convention/Assembly for the Church of the Nazarene. That is the same reason I am in Indianapolis this week. I have attended plenary sessions, workshops, committee meetings and worship services. I have established a morning hotel routine of getting coffee from Starbucks and checking my email, etc. while seating in the lobby. (Free wi-fi is available in the lobby) I appreciate the ease of getting to the convention center via the walkway from my hotel. Did you know that “50% of the US population lives within an eight-hour drive of Indy”? Probably why it is a good place for a convention. Yesterday I had a free afternoon so I decided to go for a walk to explore a little. I didn’t want to head towards the shopping area. The temptation to purchase unnecessary items or even necessary things would have been great so no shopping. I had read in the Indy Visitor Guide in my hotel room that there was a canal running through the city. Really?!? I didn’t know there was a canal. I have been here three times before and never knew that. So I set off to find the canal which it turns out was very close to my hotel. It is a lovely area with gardens and many of the museums back onto it. There were people in rented paddle boats as well as people pedaling surreys on the walkways. There were koy fish in the canal and no swimming signs. There are bridges that cross over the canal and underneath those bridges there are painted murals. It is very clean and calm. I had read that there was a Congressional Medal of Honor Memorial along the canal. The Memorial according to the visitor guide “celebrates the 3,456 people who have received our country’s highest award of military valor. Their names are on 27 curving glass panels at this one-acre memorial, which represents conflicts dating back to the Civil War all the way through the wars in Afghanistan and Iraq.” I was awed by the sheer number of people who have received “this highest military honor for personal acts of valor above and beyond the call of duty.” I am grateful to those who give so much for my freedoms. My time of wandering was growing short and I needed something to eat before my next plenary session so I continued on for a short distance and then ascended a stairway back up to street level. At the top of the stairs was a very large piece of black granite that looked like it had be broken in two. I thought I have stumbled upon a September 11 Memorial and I was right. It said “September 11, 2001 we will never forget.” Go figure! I was struck again by the fact that my personal lose is in the midst of a national tragedy. I actually said thank you to Indianapolis. The memorial is well done. There are two large pieces of World Trade Center steel placed the way the towers stood. There is an eagle on top of one of the “towers”. There are also 4 smaller pieces of granite that act as a timeline – first plane hits tower, second plane hits tower, plane hits Pentagon and plane crashes in Pennsylvania. Each has an etching of either WTC1, WTC2, Pentagon and a PA map. I took a bunch of photos which will have to be posted when I get home. I have a new camera and will need to download or is it upload those photos to my computer before I share them. I will share them later in the week. Lesson learned about traveling this week. Walk in a different direction and you may find something beautiful or meaningful or both. Travel Tuesdays is a day late due to no “free” internet in room. 1.Those budget cuts you hear about on the radio are real. There was one TSA agent checking boarding passes and id’s at the security checkpoint in terminal A. One?!? 2.The lady in line behind me, who was so worried about the slow moving line, did nothing to help the line move faster. Case in point. She was carrying an open bottle of water and she didn’t have her boarding pass or identification out. Oh and some way or the other, she ended up in front of me. The TSA agent did call her forward when she stated she was going to miss her flight but she wasn’t ready. In case you were wondering, everyone else in line was rolling their eyes and shaking their heads but in the friendliest way. 3.For some reason unbeknownst to me, I am the person who gets either the full body scan and/or the hand swap. Today it was both. 4.Parents traveling with multiple children will do anything to keep them quiet at the airport. I saw a family of five with the 3 children being under the age of 8. Mom and dad were eating sandwiches and each child had a giant double chocolate muffin. The kids seemed to love their muffins, parents had a few moments of sanity and many wipes were available for the clean up after “lunch”. These were obviously seasoned traveler parents. 5. I wanted to be super organized for this trip. Ten days in a long time to be away and I didn’t want a big suitcase. So, I had my list of clothing. Colored coded two tops per one bottom. I limited my shoes. I decided to think of this trip as a test run for Japan. Only problem was when I got to the airport, I didn’t have my passport. I always travel with my passport as my form of identification. No worries for this trip, my driver’s license would work as id but that won’t fly for Japan. Oh, the best laid plans. Bruce would smile about this. He loved dogs especially big dogs. He would say he wasn’t a hero. He was just doing his job. On Father’s Day, I would like to say thank you to all those men who have done and are doing their “jobs” to be fathers to their sons and/or daughters. I know I was blessed to be the daughter of James R Clark Jr. and the wife of Bruce Van Hine. And thank you RH for letting me know about Van Hine. Today I had a delightful day touring Brooklyn with friends. A very specific part of Brooklyn called DUMBO. DUMBO is an acronym for Down Under the Manhattan Bridge Overpass. 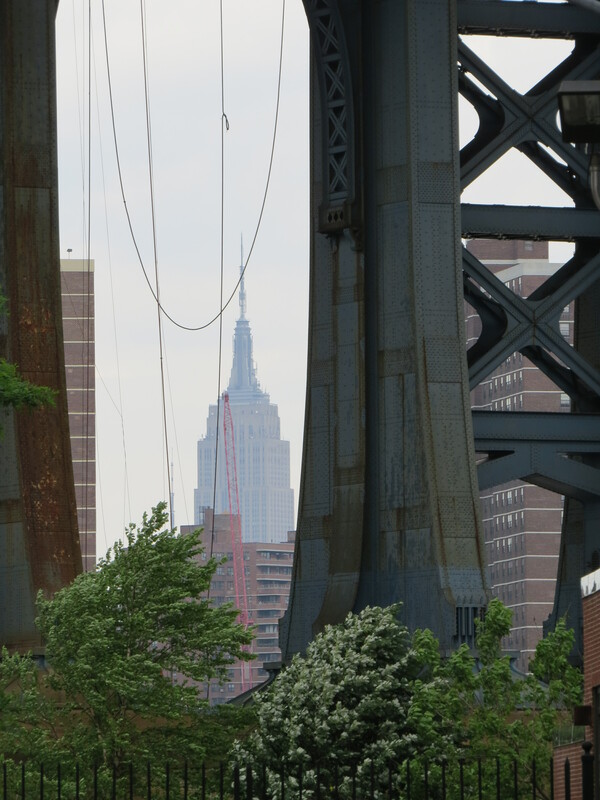 At one point on our tour we were truly in DUMBO – Down Under the Manhattan Bridge Overpass. The Empire State Building can be seen through the arches under the Manhattan Bridge. Our guide stated that the Manhattan Bridge was built before the Empire State Building and the bridge builder “framed” the building perfectly in the arches like he knew it was coming. My friends and I started our adventure with lunch at Juliana’s – www.julianaspizza.com. Delicious pizza and yummy cannolis. We ventured across the street to meet up with our tour guide. Our tour was lead by Dom Gervasi, the owner and producer of Made in Brooklyn Tours – www.madeinbrooklyntours.com. Dom started Made in Brooklyn Tours a few years ago. He was a wonderful tour guide. He was a wealth of knowledge but with the right mix of history and antidotes. Our tour lasted 3 hours and we ventured all around DUMBO even had an ice tea tasting at Mamselles Teas and Tarts and a bon-bon tasting at Jacque Torres www.mrchocolate.com. I learned the Brooklyn was originally well-known for manufacturing – especially of sugar and coffee. During the “heyday” of manufacturing more people lived in Brooklyn than live there today. The area suffered greatly when manufacturing was no longer the main industry. There are train tracks visible in the street from when the barges would deliver supplies and then transport those items by train to the factories and then back to the barges. Today small coffee roasters are making their home in DUMBO. We visited Brooklyn Roasting Company www.brooklynroasting.com. Unfortunately we didn’t have time for coffee but it was great to see small business people. One of my favorite stops on the tour was Jane’s Carousel. The carousel was originally in Chicago (I think) and sold when an amusement park burned down. It was built by the Philadelphia Toboggan company. Most carousels are sold in parts but this one was sold whole. It has been totally restored and the horses are beautiful. There was damage after Super Storm Sandy but it has been repaired and is open for business. It is in a “glass building” so it is open year round. This post shows how random I truly am. While driving into the city today, I heard that Senator Frank Lautenberg had died. My sister was an intern for Senator Lautenberg one summer. Hearing of his passing reminded me of a trip I had taken to visit her while she was in Washington DC. That same summer Bruce had wanted to attend a Firefighter Convention in Baltimore . So we decided to include the Firefighter Convention, the Washington DC trip and a trip to Kansas in our summer vacation plans. We would stay at hotels in Baltimore and Washington then tent camp in St Louis and continue onto Bruce’s sister’s home in Kansas. There are a couple of funny antidotes from that trip that still make me smile or is it cringe?!? Emily wondering “where the seatbelts were on the train?” Meghan being folded into the new umbrella stroller as we crossed the street. But the thing I always remember was when we returned from this adventure and people asked my kids “so what did you do on your big trip?” My girls responded “we saw the big horses at the place they make beer!” Did I mention they had been to the Baltimore Aquarium, ridden the train from Baltimore to Washington DC, had a private tour via my sister of the Capitol and even gone in the Senate chambers when it was in session. And we visited the Air and Space Museum of the Smithsonian, driven by all the Memorials at night, swam in the hotel’s rooftop pool, seen the Arch in St Louis and visited the St Louis Zoo. And the *Anheuser Busch tour was the thing they liked best. Oh, I did I mention they were 4 and 7 years old. And people especially church people give you funny looks when your kids talk about “the place they make beer.” Still makes me laugh. The other note worthy story happened on the journey home. When we left Kansas, we drove back to St Louis for our first stop. It was later than we had planned and it was raining. As Bruce got out of the truck to register us, I said “see if one of the cabins is available.” When he returned, he informed me “there were no cabins and the train runs right by here.” I didn’t really pay attention to the train comment. Setting up a tent and fixing dinner in the rain with two young children was not my idea of fun but “we” muddled through. The girls sat in the pickup truck as we set up the tent and some way or the other I made dinner. We cleaned up and crawled into our sleeping bags. I looked at Bruce and said “this is the last tent camping trip I am doing.” And then in the middle of the night, the ground started rumbling and the train rolled by. In the Midwest the trains are long, very long and the ground shakes, really shakes. And I thought this is how the Native Americans felt when the white man came. In the morning the sun was shining and I could see that the train tracks were very close. Years later Bruce would “confess” that he didn’t ask about a cabin. He figured we had the tent so why not sleep in it. Oh, my!